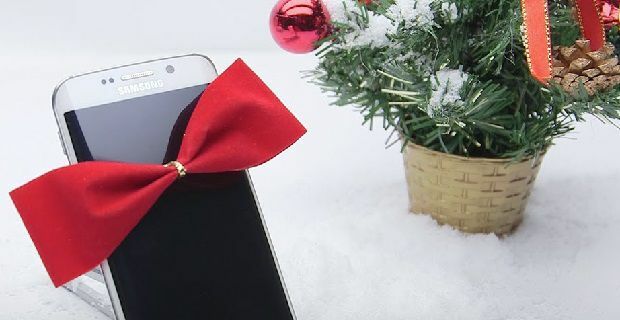 If you’re considering buying a mobile phone for someone’s Christmas present, which one should you consider? You’ll want the most up to date device and you’ll need something affordable so which ones fit the bill? There are basically two choices: an Android device or an iPhone. While most of us understand how to use the iPhone, Android devices normally have similar functionality but come with additional perks. Android smartphones often allow you to increase the memory with additional memory cards. That’s not possible with iPhone. With Android devices you also get a wider selection of apps so we recommend that your stocking is filled by an Android device. But which one? The next choice you have to make is between two brands: Sony Xperia or Samsung Galaxy. The S6 is the Samsung Galaxy device we’d recommend. It’s pricey at £549.99 from somewhere like carphonewarehouse.combut this is a classy phone with loads of functionality. This device looks great thanks to a sloping design that hides shortcut keys on one side. The 5.7 inch display’s impressively large and very clear, and the 16-megapixel camera is great no matter what you’re photographing. If you consider yourself a James Bond fan, this is the phone for you. The secret agent uses the Sony Xperia Z5 throughout the movie Spectre. You’ll need £464 to get your hands on one. That’s the price we found on amazon.co.uk and it seems to be the best price on the market right now. Exceptional battery life, a case that’s strong and waterproof and a video that shoots in 4k resolution push this one above the Samsung. This isn’t a Sony or a Samsung but it’s also a great Android phone. The HTC One A9 is very similar to the iPhone 6 but comes with a higher resolution screen, and the 13 megapixel camera’s excellent too. Decent battery life and great audio make this is phone that’s good for every type of user. The best price we’ve found is £419.99 from amazon.co.uk.